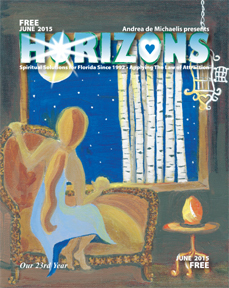 Hello and welcome to the June 2015 edition of Horizons Magazine. Happy Summer Solstice, a time when the sun lingers the longest of any other day. It is a time of intensity, renewal and great potential. I typically do a burning bowl ceremony at Summer Solstice, just making some symbolic notes of things I’d like to be free of, which I then burn in my chimenea. I think of it as a time of renewal. A time to make things new and get clear what I want for the rest of the year. Summer Solstice is also Father’s Day. A time to celebrate the men in your life. Tell them how much you appreciate them, maybe light a candle for those who have moved on. “…the terrible discovery that men make about their fathers sooner or later is that the man before him was not an aging father but a boy, a boy much like himself, a boy who grew up and had a child of his own and, as best he could, out of a sense of duty and, perhaps love, adopted a role called Being a Father so that his child would have something mythical and infinitely important: a Protector, who would keep a lid on all the chaotic and catastrophic possibilities of life.” ~Tom Wolfe, The Bonfire of the Vanities. For the past 20 years, I’ve been used to working almost every holiday, because that’s when some of my clients are alone, have the time and most want the appointment. My own dad died on Father’s Day, but I know we survive in consciousness after the change called death, so it’s not a sad day for me. For others, it can be a day that is difficult to get through, as is Easter, Christmas and Thanksgiving. I typically have several phone sessions scheduled and that’s how my holiday is spent. Happily spent since I enjoy my work. I enjoy interacting with everyone and I learn from them. I learn about myself as I learn about them. The past two Father’s Days I’ve spent relaxing at home with no calls. What I learned about myself is that I miss working on a day that I know a lot of emotion is in the air, a day I’m used to being available for friends to chat it out if they want to. Old habits die hard. D’s story: A sudden windfall of dollars, do you play with it or pay back? A friend attracted an amount of money she’d been wanting for a new project. She considered it a windfall and was excited beyond words she could now make her dream a reality. She began making plans and went to sleep a happy camper. She called me the next day in a quandry. As she was making a list of what to buy, she began to call the friends and family who’d supported her vision to tell them the good news. During their conversations she was reminded that a friend paid her cell phone bill the past year, her mom let her live rent free and her dad loaned her his car. While no one was asking for her to pay them back, she began a tally in her head, deducting those amounts so she could surprise them by repayment. By the time she added it up, she was left a far cry from what she needed for her project. Her question to me was, should she pay everyone back first or do her dream first? I asked how did each choice feel to her? She told me her parents had always been generous and had never asked for repayment of anything through the years. They probably never expected to be paid back. That would let her keep $2500. But she also felt that it was time she stood up and did for herself because they wouldn’t always be around. They didn’t have much more than she did, yet they always provided when she asked. She really wanted to move forward but also felt the fair thing to do would be to pay them back. She said it felt good to know she could do that. Another $500 would go to a man who’d paid her phone bill the past year. He was someone with his own financial struggles, yet he got her a cell phone when she needed one and he paid the bill each month. She said she’d feel bad if she didn’t pay him, although he might not expect it. She reasoned that if she began her project, there was no guarantee it would succeed, and then the money would be gone and no one would benefit from it. I told her it was more likely that since she attracted the “windfall” in the first place, she was a vibrational match for attracting more of the same. The fact that she was paying past dues would greatly benefit her future. She’d have nothing hanging over her head, she’d owe no one and that in itself would remove a giant barrier of resistance from the law-of-attraction equation. She opted to pay everyone back first. That felt so good she treated herself to a spa day and splurged on $10 of lottery tickets. No surprise that she got 5 of 6 of Saturday’s numbers and won $5,488.50. That was twice the amount of her windfall. Would she have attracted that had she not made the decision to pay everyone back first? Who knows. All she did was follow her heart and do what felt the best to her to do. She did what she would do if the money did not matter, as if she was doing it purely in exchange for deep appreciation of what she’d been gifted with. She said she’s never felt so ready for her future. Roadblock? Do you gripe about it or slink past it on to your next good thing? WHAT TO DO? A roadblock has been thrown up and you’ve had a disappointment. Do you rail against the perpetrator, point fingers and tell everyone you know all about it? Or do you quietly acknowledge that the Universe has your best interest in mind and, the sooner you stop whining about it, the sooner you can get on to your happier and better tomorrow? Wanting to give the other party heck is just keeping you in a place of resistance. Acknowledge that you may not now understand what is happening. Trust and expect that you will always end up in a better place. Then find something to be happy about. A friend didn’t buy her husband’s “oh, you misunderstood” story and told him so. He shouted that she needed to stop bringing up old stuff. Sound familiar? Old stuff? They’d never resolved ANY of it, he’d just pout until she finally dropped it. She was tired of dropping it. This was her life, too, and she didn’t want to waste another minute trying to make happen what wasn’t meant to happen. She told him he could reframe it all he wanted but he purposely lied and got caught and he was the one who kept bringing it up. If he’d stop trying to prove he wasn’t lying, they would be off the topic already. When he was calm again, she told him he should work on his issues, like cutting people off when they call him on his stuff, resolving nothing and moving from person to person with the same behavior, ignoring the carnage. He said he didn’t like that and she reminded him it’s not about him liking what she says, it’s about him making an effort to resolve his issues so he can be the man he is capable of being. Three years ago she put her own dreams on hold to focus on their shared dream which never got off the ground. She found herself doing all the work yet he said all the right things to keep the dream alive. I asked her to picture herself in a canoe with him and see the two of them paddling down the river, then to take notice of when she became the only one paddling. Without him, this wouldn’t be her dream. She decided then to stop paddling and tell him she was done with it. If he wanted it to happen, he’d have to man up and make it happen himself. She went back to her own dream and built her former nursery/floral business back up and it began thriving. Her kids got involved in the business and it was one big happy family again. And she had her husband to thank for blowing up at her as a wake up call that she wouldn’t be paddling that canoe in that direction if it were her choice and she certainly wasn’t paddling there on her own. She’s still waiting for him to get his act together, but she’s no longer holding herself back in the process. A friend asked for the quickest way OUT of the drama and chaos she’s having. The secret is to stop talking about it. Now. Don’t repeat the story to anyone else, no matter how juicy the updates. Stop participating in giving any energy to the topic and the persons involved will immediately, like magic, stop having power over you. We’re much more powerful than we think, all it takes is a little change of focus and the perception shift can be a life changing revelation. A friend complained today about her partner for the umpteenth time. What she doesn’t get is that you can only attract someone you are vibrationally aligned with. If you keep attracting “losers and users,” you’re the only one who can change that. You change it by changing your daily focus. Organize your thoughts to stay focused on something a little happier and you’ll attract an upgrade, I promise. You can only attract what you are vibrationally in tune with. You simply need to tune to a different channel. Maybe that means going to different venues for fun, maybe it just means focus on different people at those venues. You change your world by changing your focus and changing your self talk. This entry was posted in Uncategorized on June 1, 2015 by Andrea.